Did you notice the title of this post? 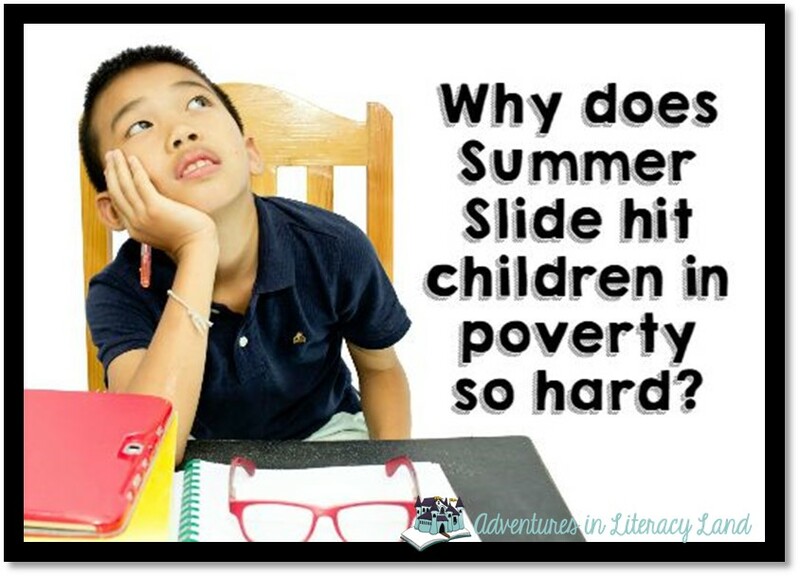 Well, it is probably no surprise to any of us that summer learning loss hurts poor children more than any others. In fact, we've had data for a very long time proving it, but why is it that we continue to have our poor children falling further and further behind when we know the reason why? We have remediation programs in place during the school year, and we offer many children summer school. We may even send home summer work for them. Even so, why can't we seem to get to the root cause of the issue and fix it? What reasons popped into your mind? Perhaps you thought that the parents just don't take the time for reading? Maybe you thought that the kids are too busy swimming and playing, or were you thinking that teachers just don't take the time to tell parents how important it is? Well, one of the real issues is the fact that many children lack access to appropriate reading materials, and each year children go without, the further behind they get. Here's a brief recap of Allington's research. 1. Poor children get most of their reading material from school or classroom library collections (Lamme 1976) and schools serving large numbers of poor children have smaller, older, and less diverse school and classroom library collections (Allington, Guice, Michelson, Baker, and Li 1996, Duke, 2000; Neuman, 2009). This means poor children have a much more restricted selection of books. It was also found that they have fewer visits to the library, and more restrictions on what can be taken home. 2. Beyond the school setting, wealthier children had a greater number of bookstores available to them (3:1), but even worse are the differences in books available for purchase 16,000 compared to 55 books. On every measure, researchers found a "gaping difference." 3. Family income has been shown to be a quite powerful predictor of the number of age-appropriate children's books and magazines that are available in the home. 4. 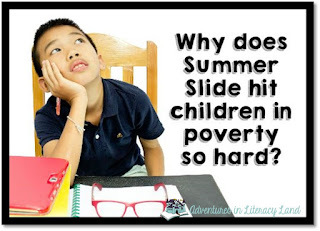 Access is not the only cause of summer learning loss. Children's efficacy beliefs are linked to academic performance including their experiences as more or less successful readers. A history of less success with reading produces a lower sense of self-efficacy than a history of successful reading experiences. 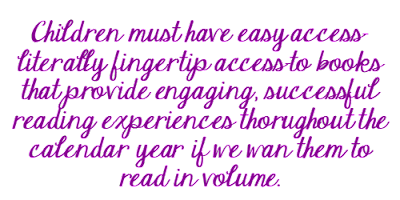 Poor readers are more likely to be assigned texts that are too hard, texts they read with little fluency, limited accuracy, and without comprehension. Therefore, poor readers are less motivated to read voluntarily. 5. 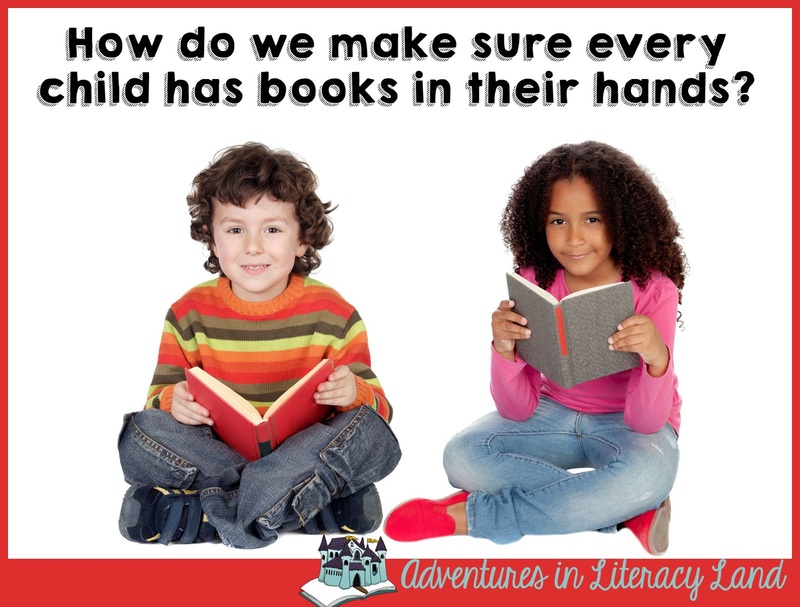 Creating classroom environments where successful reading is the norm for all children means that a one-size-fits-all curriculum plan (with everyone reading the same book) cannot produce a consistent pattern of successful reading. Children need books they can read accurately, fluently, and with understanding. 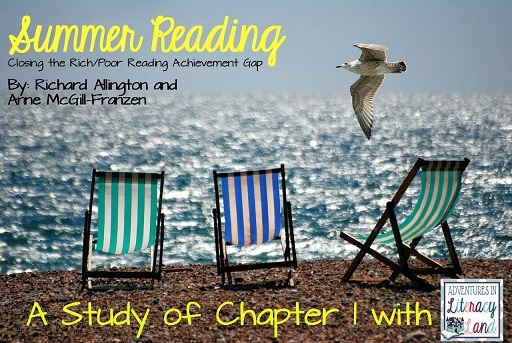 (McGill-Franzen 1993) to feel successful, and successful school reading leads to greater motivation to read voluntarily. As we look for ways to get quality literature that matches student needs and interests into the children's hands and motivate the children to read them, we need to consider these key principles. With your reading plans during the school year, ensure that all students are reading extensively during the school day. 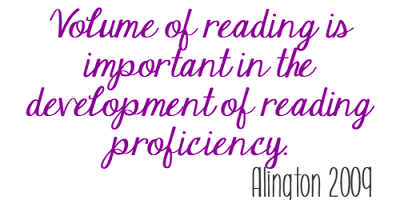 A focus on the volume of reading is different from a focus on time allocated for reading instruction. The majority of the reading block should be spent reading. 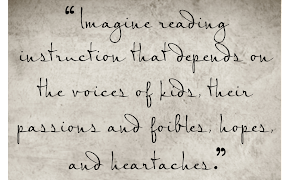 Your reading plan should enhance students' desire to read voluntarily at night, on weekends, and during the summer. Program plans should make sure classroom book collections match the needs and interests of all students. 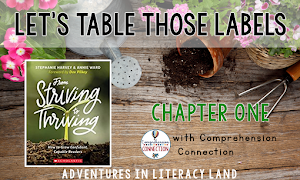 Classroom libraries should include hundreds of titles at the appropriate level of difficulty. Programs should emphasize that students have books available for take home on weekends and throughout the summer. Finally, programs should help teachers develop skills in matching children and books. 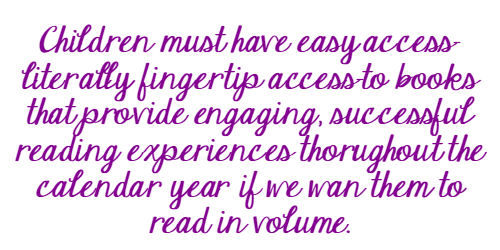 At the close of chapter one, Allington leaves the reader with an important note keeping these two principles in mind. 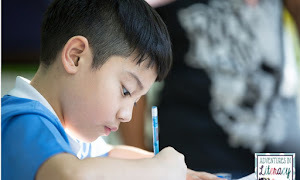 He says, "All children need consistent access to rich and explicit demonstrations of the thinking that proficient readers do before, during, and after reading, or expert instruction." It is during the independent practice that students use these skills and strategies and come to own them. Without regular successful reading practice, reading proficiency seems more difficult to achieve. So, readers, we have plans to make, don't we? Can we idly sit back and allow children who are at such a disadvantage continue to fall further and further behind, or are we going to make reading plans? 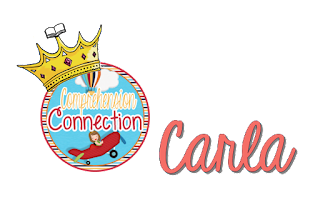 Come back tomorrow to read about and share intervention plans that increase children's access to reading materials and that improve reading proficiency. Great post!! These posts will be so important for me to reference throughout this year as I prepare for next summer! I have a lot of work ahead of me. Motivate, motivate, motivate. Build stamina and more stamina. Thank-you! It makes me sad to know that my kiddos may not have what they need to be successful as they head to first grade. I made them big summer kits, but you always wonder if it is enough. I hope they took advantage of it. We have done the same, but the biggest takeaway I got was that we need to meet them all year with texts at their level to get the motivated, but then open our libraries or take books into their neighborhoods. You have to read this book then. I work with a low income population too, and I definitely have a few things I'll change in book routines. I hope you'll check out the follow up posts too. The key is to get help in running it (and funding). We discussed loading up a van with crates of books and going out to our neighborhoods. I bet you could get donated books pretty easily if you put our a message with local media. If you could find a church willing to give you space, that might work for a workshop. We used a community center and a local church for two parent meetings, but with my family schedule, I just couldn't get it worked out to go out as I'd hoped. My community is fairly small though compared to some of the locations in the study. It's probably more challenging in large cities.